Thailand has developed into a popular Yacht Charter destination over the recent years. With the extension of marinas, the land has also become interesting for the racing scene that has a yearly get together during the King’s Cup in Phuket. Sailing beats in Thailand are the Andaman Sea, Phang Na Bay and the Gulf of Thailand. Phuket in the Andaman Sea, Ko Chang in the Bay of Thailand or Ko Samui surely are the most important charter locations – unless you happen to set off from Burma or in the neighbouring Langkawi in Malaysia to sail off the coast of Thailand. A little hint for orientation: Ko means island – but is also spelled Koh or Kho. To enjoy this beat sailors will need some experience. The best season for sailing is from November till April, predominately with winds from Northeast. Thereafter rainstorms prevail, it gets hotter and the wind mainly blows from southeast. On the other hand, the well protected bay of Phang Na is a beautiful beat in summer – the bay, only about two sailing-hours away from Phuket, is only connected to the open sea in the South and protected as a nature preserve – its mostly known for its bizarre limestone formations. As with other Tropical sailing waters, this landscape offers lots of nature like rainforests and waterfalls worth seeing. Numerous bays invite for anchoring – with lots of life in restaurants and bars ashore. The light and delicious Thai cuisine and the friendly people of the land of smiles welcome sailing crews on shore leave. Picturesque fishing villages and wooden huts on piles are popular photo subjects. 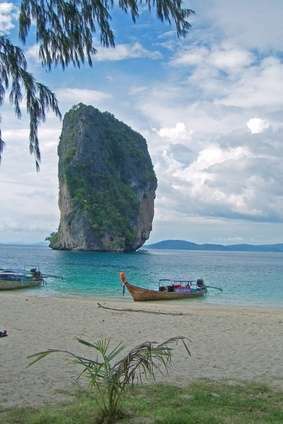 The island of Phuket, largest island of Thailand, is separated from the mainland by only a small channel. Here tourism started already 3 decades ago, the town of Patong is said to be a tourist centre. The inhabitants engage in agriculture with Indian rubber-plantations, pineapple and banana cultivation and coconut trees, which they use for the extraction of Kopra, fishing and pearl farming. There are dreamlike beaches especially in the West of the islands; pristine jungle still runs riot in the national park in the East. Highlights of Phuket: the sunset on the southern cape in Laem Phrompthep with the view onto sea and the offshore islands, the panoramic view from 3-Bay View Point South of Kata with a view onto the beaches of Karon, Kata Noi and Kata Yai, the Buddhist Temple Wat Chalong in the Southeast and Put Yaw, a Chinese Temple in Phuket town. Phuket is seat to several Yacht Charter companies and is equipped with modern marinas. Most Yacht Charter crews sail towards Ko Phi Phi and the Similan Islands when starting from Phuket. The Ko Raya Archipelago is located only three-quarters of an hour away from Chalong Bay on Phuket. Coconut trees, jungle, only a few inhabitants and above all dream beaches can be found on Ko Raya Yai, Ko Raya Noi is overgrown by jungle and doesn’t have any beaches but beautiful spots rich in fish for snorkelers. A wonderful diving beat can be discovered by friends of the under water world off the nine Similan Islands west of Phuket, that form the Mu Ko Similan National Park together with two other isles. 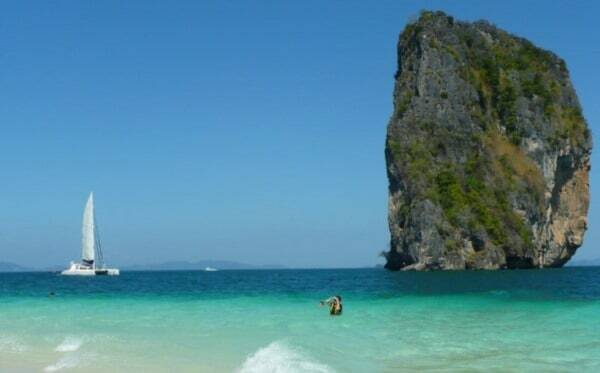 The Ko Phi Phi Archipelago has mainly gained popularity thanks to the film “The Beach” that was shot on Ko Phi Leh. Parts of this archipelago are among others the main island of Ko Phi Phi Don, known for its sheer rock walls, and the islands of Ko Bida Nok and Ko Bida Nai, especially interesting for scuba divers, the fishing island Ko Yung and the bamboo island Ko Mai Phai. On the East coast of Thailand in the Gulf of Thailand with more than 50 enticing islands, lies the charter base on the second largest island of Thailand, the island of Ko Chang, named after its elephant-like outline. The border to Cambodia is very close by. There are as well charter yachts based in Langkawi in Malaysia – one-way charters between Thailand / Phuket and Langkawi are possible in both directions. Exploring the beautiful coast of Myanmar – with the fascinating Mergui archipelago – is only possible aboard a crewed charter yacht – please ask for offers. There are important yacht charter fleets with sailboats and catamarans for bareboat charters in Thailand that are not listed in our Yachtfinder – please ask for offers. And of course we will be glad to send you offers for the most beautiful luxury charter yachts with crew in this area as well. Thailand is as well a very popular destination for charter holidays on board of luxury yachts, super yachts or crewed catamarans. Here you can find more information about luxury yacht charters. 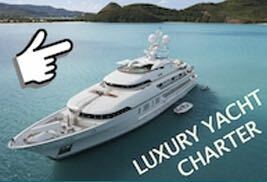 We would will be glad to organize your luxury yacht charter in the Thailand – please ask for offers!